Looking for private in-home or in-studio Flute lessons? Our Adkins teachers are ready to get you started. Find your teacher today! all levels (beginning through college, advanced, adult. - Weekly lessons to develop and improve skills with proper intonation, articulation, dynamics, rhythmic meters…and more! - Advanced techniques: altissimo range, ornamentation, improvising, circular breathing, etc. I have been playing flute professionally for over six years. My first performance was a production of "Chicago," and it opened up opportunities to play multiple woodwinds in all kinds of contexts. Music lessons should be fun, encouraging and full of music that you love. They are an opportunity to learn something new, show your improvement, and receive correction, encouragement and praise. Students and instructors should play together frequently throughout and the time should be balanced with theory, technique and exercises, sight-reading, and performance and seasoned with introductions to a variety of music and styles. I like to encourage students to play because they love to play and to find the music that is an integral part of their soul, then to share that with others through performance. What do you want to do with or gain from your music? We will work toward your goals. Music is a huge part of my life and I love sharing that with others. Helping and seeing others discover and develop their talents and find joy in music is something I love. I come from a musical family and have been singing and playing the piano since before I can remember. Flute (and piccolo) lessons began for me in the 7th grade and I participated in both concert and marching bands from there though college. Now I take regular opportunities to play with various groups of all sizes. I have taught music (theory, flute, piano and vocal) to students of varying ages and backgrounds both individually and in groups. Working as the woodwind and marching assistant at my alma mater was a thrill and I enjoied seeing and helping students push themselves and reap the rewards of both talent and recognition for their efforts and accomplishments. While participating in the Prince William Community Band, I had the opportunity to learn to play some percussion instruments and played in that section for a couple years. I have been a music director for several years and enjoy arranging music. It is never to late to start learning if you have the desire and persistence. Jennifer is patient, flexible, and encouraging. I highly recommend her! Jennifer is a wonderful teacher. She was very kind, very patient, and very good at instructing. For two people who have never learned anything about the flute, my child and myself feel comfortable and confident in practicing what we’ve learned! Often for first lessons when setting out to practice you can’t remember what to do. She was amazing! Experienced flute teacher seeking beginning and intermediate students. Former student of New York-based flutist John Savage. Well-studied in the Berbiguier Etudes for flute, as well as pieces by Mozart, Poulenc and Bach. 2017 in the BYU Wind Symphony, and played principal clarinet in the BYU Symphony orchestra in 2018. In addition to my performances at BYU, I have performed and collaborated with numerous groups and artists on the Provo and Salt Lake music scenes as both a commercial and studio artist, such as my collaboration with Utah-based vocalist Emily Merrell in her performance at the 2018 Jazz Education Network Conference in Dallas, Texas. I also returned to the northwest in 2015 to take part in the Port Townsend Jazz Festival, where I studied with jazz greats such as Terrell Stafford, Steve Wilson, Bob Mintzer and others. I am a passionate teacher and am happy to take students of all levels, over Skype or in person. Andrew has been an awesome instructor. I've had two lessons online with him so far (and have many more scheduled). He's patient and able to work around my irregular schedule. He gives me exercises and songs to work on, and I feel like I'm learning something every time I practice. I would highly recommend him - especially as a beginner. Andrew is patient and kind with my son, but not too soft on him. He is doing very well with my middle schooler. He is teaching him things on a one-on-one level that his band director isnt able to in such a large group setting. Thank you Andrew! I appreciate you pushing him and inspiring him. Anyone and everyone! Total beginners to experienced musicians. I gladly encourage and accept all flutists from any background with any level of experience! I believe each flute player has a unique voice that we can, together, study, practice, and hone into a beautiful sonority. What will we do during the lesson? How do I prepare? Lesson time is meant for learning new concepts/techniques/ways to practice. It is all about the exchange of information! Some portion of lesson time may be designated for duets, questions, music theory/history/ear training, etc. The majority of the lesson will be spent working on technique, rhythm, tone, repertoire, and whatever else the student may need. 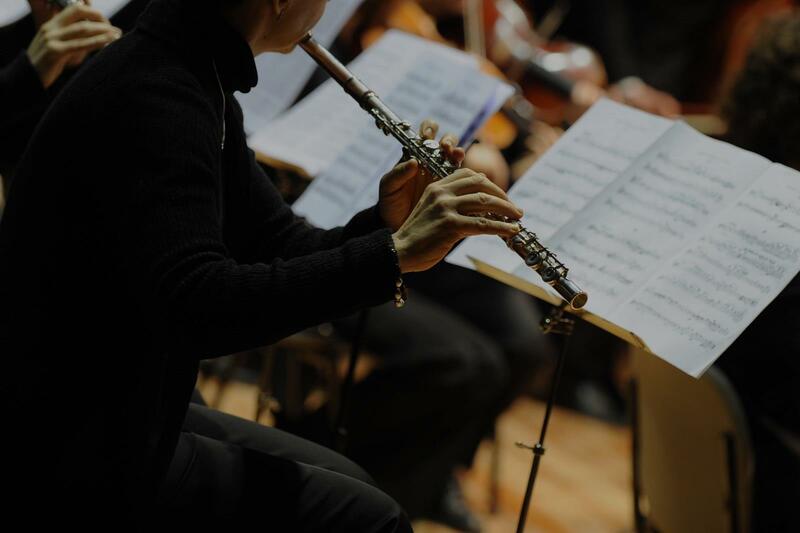 The individual student is expected to practice to prepare for each lesson - how much time is based on the individual flutist. Many factors contribute to deciding the appropriate amount of practice time, and together we will assess what works for the student and their goals. Originally from Taylorsville, Georgia, Erin W. is a flutist and flute teacher currently residing in Chicago, IL. She is pursuing a Master of Music degree in Flute Performance from DePaul University, where she is a recipient of a performance award in the studio of Mark Sparks. She has private lessons and attends studio classes that are led by many well known flutists from the Chicago area (Chicago Symphony Orchestra members as well as Chicago Lyric Opera and freelancers) and DePaul community. ring her time there she studied with Angela Jones-Reus, and she was featured on many recordings - from the UGA Wind Ensemble recordings to a flute studio holiday CD! Erin frequently performs in solo and chamber ensemble settings, and has performed with the 5th Wave Collective, a Chicago-based performing group dedicated to performing works by female composers, and ensembles across the Southeast including the Atlanta Opera Orchestra, the Columbus Symphony Orchestra, and the Chattanooga Symphony Orchestra. Erin has also collaborated with many artists, notably Grammy-nominated John Burke, with whom she performed on a CD titled “Superstratum” (available on iTunes, Spotify and online). Erin has presented workshops, sectionals and masterclasses to a multitude of audiences: from beginner flutists to upper level performers, and even to full woodwind sections with oboists, clarinetists, bassoonists, and saxophone players. Erin has successfully aided flutists in her private studios to attain their personal goals as well as further develop their musicianship. In Erin’s studio she prioritizes healthy performance techniques, positive mindsets, and encouraging well-balanced musicianship. She currently maintains a private studio in Chicago in Lincoln Park, and teaches students from around the world via Skype. Erin has performed at the National Flute Association Convention and Georgia Music Educator Association Conventions, and she has been privileged to perform in master classes throughout the nation with such renowned artists as Sir James Galway, Stefan Hoskuldssohn, Jeanne Baxstresser, and more. Experienced Private Lessons Teacher! Perfect for the beginner or competitive intermediate flute player who wants to earn 1st chair in competitions and band/orchestra placements. Focus on tone, facility on instrument, sight reading, proficiency in musical terms, basic music theory, and Etudes. Hello! My name is Sirena Nunez. You can call me Ms.Nunez! I have been playing flute for over 10 years! I have played with your every day ensembles like HS Marching Band and Concert band. I have also played with the San Antonio Youth Wind Ensemble, were we have had side by side concerts with many other prominent ensembles in the area and guest conductors like Larry Livingston, and Frank Ticheli! Other ensembles include the Texas State Bobcat Marching Band, Concert Band, and Women's Choir. AT San Antonio College I have participated in the Chamber Ensemble, and concert choir, and the Heart of Texas Band. I will be earning my Bachelors degree at UTSA with an emphasis on flute performance. "First lesson was great! He's very organized. Good with kids too." San Antonio, TX teacher: Neil D.
"Encouraging 1st lesson. Motivated & excited. "I had my first lesson with Neil, so far so great. He is a good teacher and takes pride in his work. He is thorough and seeks to enhance my knowledge."